This chapter describes many of the widgets that are provided with FLTK and covers how to query and set the standard attributes. Fl_Button - A standard push button. Fl_Check_Button - A button with a check box. Fl_Light_Button - A push button with a light. Fl_Repeat_Button - A push button that repeats when held. Fl_Return_Button - A push button that is activated by the Enter key. Fl_Round_Button - A button with a radio circle. For toggle and radio buttons, the value() method returns the current button state (0 = off, 1 = on). The set() and clear() methods can be used on toggle buttons to turn a toggle button on or off, respectively. Radio buttons can be turned on with the setonly() method; this will also turn off other radio buttons in the same group. Fl_Input - A one-line text input field. Fl_Output - A one-line text output field. Fl_Multiline_Input - A multi-line text input field. Fl_Multiline_Output - A multi-line text output field. Fl_Text_Display - A multi-line text display widget. Fl_Text_Editor - A multi-line text editing widget. Fl_Help_View - A HTML text display widget. The Fl_Output and Fl_Multiline_Output widgets allow the user to copy text from the output field but not change it. The string is copied to the widget's own storage when you set the value() of the widget. The Fl_Text_Display and Fl_Text_Editor widgets use an associated Fl_Text_Buffer class for the value, instead of a simple string. Fl_Counter - A widget with arrow buttons that shows the current value. Fl_Dial - A round knob. 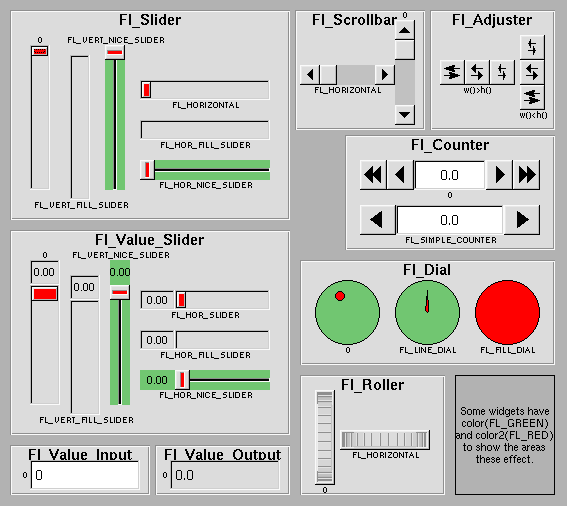 Fl_Roller - An SGI-like dolly widget. Fl_Scrollbar - A standard scrollbar widget. Fl_Slider - A scrollbar with a knob. Fl_Value_Slider - A slider that shows the current value. The value() method gets and sets the current value of the widget. The minimum() and maximum() methods set the range of values that are reported by the widget. Fl_Double_Window - A double-buffered window on the screen. Fl_Gl_Window - An OpenGL window on the screen. Fl_Group - The base container class; can be used to group any widgets together. 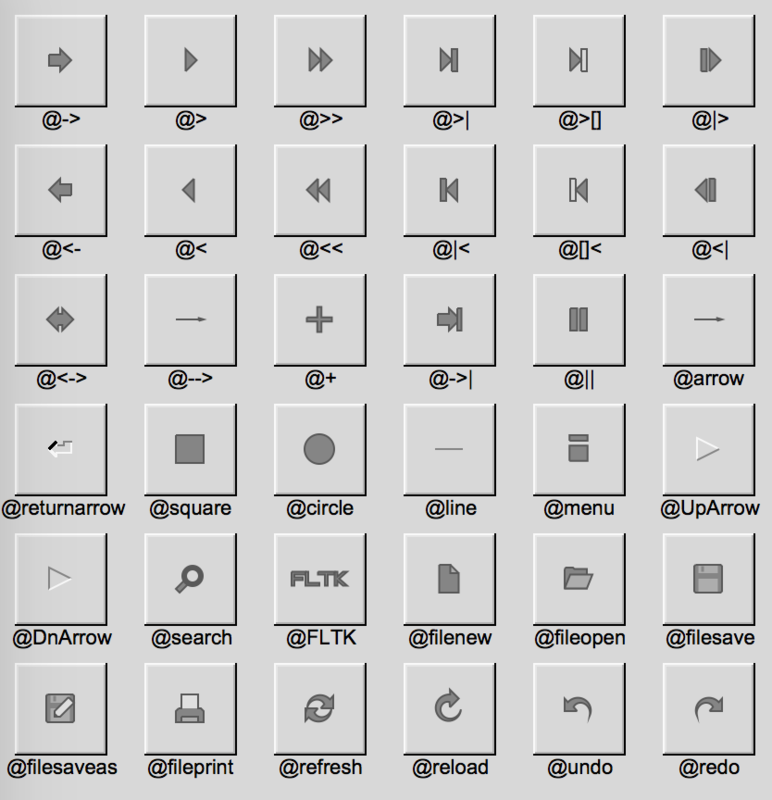 Fl_Pack - A collection of widgets that are packed into the group area. Fl_Scroll - A scrolled window area. Fl_Tabs - Displays child widgets as tabs. Fl_Tile - A tiled window area. Fl_Window - A window on the screen. Fl_Wizard - Displays one group of widgets at a time. The size and position of widgets is usually set when you create them. You can access them with the x(), y(), w(), and h() methods. If you change a widget's size or position after it is displayed you will have to call redraw() on the widget's parent. FLTK stores the colors of widgets as an 32-bit unsigned number that is either an index into a color palette of 256 colors or a 24-bit RGB color. The color palette is not the X or MS Windows colormap, but instead is an internal table with fixed contents. See the Colors section of Drawing Things in FLTK for implementation details. Other symbols are used as the default colors for all FLTK widgets. The full list of named color values can be found in FLTK Enumerations. If TrueColor is not available, any RGB colors will be set to the nearest entry in the colormap. The type Fl_Boxtype stored and returned in Fl_Widget::box() is an enumeration defined in Enumerations.H. Figure 3-3 shows the standard box types included with FLTK. FL_NO_BOX means nothing is drawn at all, so whatever is already on the screen remains. The FL_..._FRAME types only draw their edges, leaving the interior unchanged. The blue color in Figure 3-3 is the area that is not drawn by the frame types. You can define your own boxtypes by making a small function that draws the box and adding it to the table of boxtypes. fl_down() returns the "pressed" or "down" version of a box. If no "down" version of a given box exists, the behavior of this function is undefined and some random box or frame is returned. See Drawing Functions for more details. 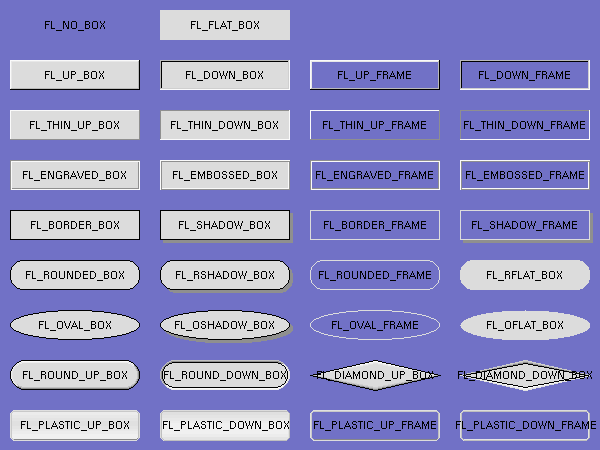 fl_frame() returns the unfilled, frame-only version of a box. If no frame version of a given box exists, the behavior of this function is undefined and some random box or frame is returned. See Drawing Functions for more details. fl_box() returns the filled version of a frame. If no filled version of a given frame exists, the behavior of this function is undefined and some random box or frame is returned. See Drawing Functions for more details. The last 4 arguments to Fl::set_boxtype() are the offsets for the x, y, width, and height values that should be subtracted when drawing the label inside the box. A complete box design contains four box types in this order: a filled, neutral box (UP_BOX), a filled, depressed box (DOWN_BOX), and the same as outlines only (UP_FRAME and DOWN_FRAME). The function fl_down(Fl_Boxtype) expects the neutral design on a boxtype with a numerical value evenly dividable by two. fl_frame(Fl_Boxtype) expects the UP_BOX design at a value dividable by four. The label(), align(), labelfont(), labelsize(), labeltype(), image(), and deimage() methods control the labeling of widgets. The label() method sets the string that is displayed for the label. Symbols can be included with the label string by escaping them using the "@" symbol - "@@" displays a single at sign. Figure 3-4 shows the available symbols. '$' flips the symbol horizontally, '%' flips it vertically. Thus, to show a very large arrow pointing downward you would use the label string "@+92->". FL_ALIGN_CENTER - center the label in the widget. FL_ALIGN_TOP - align the label at the top of the widget. FL_ALIGN_BOTTOM - align the label at the bottom of the widget. FL_ALIGN_LEFT - align the label to the left of the widget. FL_ALIGN_RIGHT - align the label to the right of the widget. FL_ALIGN_LEFT_TOP - The label appears to the left of the widget, aligned at the top. Outside labels only. FL_ALIGN_RIGHT_TOP - The label appears to the right of the widget, aligned at the top. Outside labels only. FL_ALIGN_LEFT_BOTTOM - The label appears to the left of the widget, aligned at the bottom. Outside labels only. FL_ALIGN_RIGHT_BOTTOM - The label appears to the right of the widget, aligned at the bottom. Outside labels only. FL_ALIGN_INSIDE - align the label inside the widget. FL_ALIGN_CLIP - clip the label to the widget's bounding box. FL_ALIGN_WRAP - wrap the label text as needed. FL_ALIGN_TEXT_OVER_IMAGE - show the label text over the image. FL_ALIGN_IMAGE_OVER_TEXT - show the label image over the text (default). FL_ALIGN_IMAGE_NEXT_TO_TEXT - The image will appear to the left of the text. FL_ALIGN_TEXT_NEXT_TO_IMAGE - The image will appear to the right of the text. FL_ALIGN_IMAGE_BACKDROP - The image will be used as a background for the widget. FL_NORMAL_LABEL - draws the text. FL_SHADOW_LABEL - draws a drop shadow under the text. FL_ENGRAVED_LABEL - draws edges as though the text is engraved. FL_EMBOSSED_LABEL - draws edges as thought the text is raised. FL_ICON_LABEL - draws the icon associated with the text. The image() and deimage() methods set an image that will be displayed with the widget. The deimage() method sets the image that is shown when the widget is inactive, while the image() method sets the image that is shown when the widget is active. To make an image you use a subclass of Fl_Image. Label types are actually indexes into a table of functions that draw them. The primary purpose of this is to use this to draw the labels in ways inaccessible through the fl_font() mechanism (e.g. FL_ENGRAVED_LABEL) or with program-generated letters or symbology. The label should be drawn inside this bounding box, even if FL_ALIGN_INSIDE is not enabled. The function is not called if the label value is NULL. The function should measure the size of the label and set w and h to the size it will occupy. The label type number n can be any integer value starting at the constant FL_FREE_LABELTYPE. Once you have added the label type you can use the labeltype() method to select your label type. The Fl::set_labeltype() method can also be used to overload an existing label type such as FL_NORMAL_LABEL. It is also possible to define your own drawings and add them to the symbol list, so they can be rendered as part of any label. name is the name of the symbol without the "@"; scalable must be set to 1 if the symbol is generated using scalable vector drawing functions. This function draws a named symbol fitting the given rectangle. You cannot delete a widget inside a callback, as the widget may still be accessed by FLTK after your callback is completed. Instead, use the Fl::delete_widget() method to mark your widget for deletion when it is safe to do so. Many programmers new to FLTK or C++ try to use a non-static class method instead of a static class method or function for their callback. Since callbacks are done outside a C++ class, the this pointer is not initialized for class methods. To work around this problem, define a static method in your class that accepts a pointer to the class, and then have the static method call the class method(s) as needed. The data pointer you provide to the callback() method of the widget can be a pointer to the instance of your class. The shortcut value is the key event value - the ASCII value or one of the special keys described in Fl::event_key() Values combined with any modifiers like Shift , Alt , and Control.